In honor of African-American History Month, Wylie House is pleased to feature two notable African-Americans who made history in Bloomington, Indiana and lived with the Theophilus A. Wylie family in the last half of the 19th century. 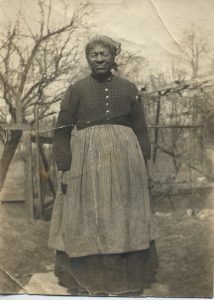 Elizabeth “Lizzie” Breckenridge was an African-American woman born in Bedford, Indiana on July 5, 1843. In 1856, the Theophilus A. Wylie family employed Lizzie at the age of 13 as their domestic servant, where she stayed for nearly 45 years. While living with the TA Wylie family, Lizzie learned to read and write. She developed a rich taste in literature and took special interest in astronomy. 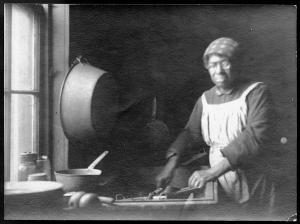 Lizzie never married, but she eventually saved enough money to purchase her own home, an important accomplishment for an African-American woman in her day. Lizzie’s home was located on S. Washington Street. 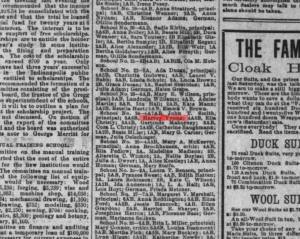 We know from an article published in the Indianapolis News in 1903 that Lizzie attended the Reformed Presbyterian Church of Bloomington, the same church attended by the Wylie family. This article, found on Page 7 of the newspaper, provides background information about Lizzie’s family. Covenanter Presbyterians who left southern states in favor of Indiana’s position against the practice of slavery formed the Reformed Presbyterian Church of Bloomington. The church was originally located on land adjacent to the Covenanter Cemetery, where Lizzie is buried. She passed away on September 25, 1910 at the age of 67. Harvey Young came to Bloomington from Indianapolis in 1882 to enroll at Indiana University and was the first African-American to do so. 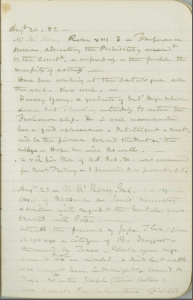 Theophilus A Wylie, in a journal entry dated August 20, 1882 wrote, “Harvey Young, graduate of Indiana High School came last Thursday intending to enter the Freshman class. He is well recommended has a good appearance – Intelligent & neat – will be a pioneer colored student in the College – Hope he will do well –”. Harvey Young boarded with the Wylie family for at least his first semester in 1883. We know from a journal entry that on at least one occasion Harvey attended church with the Wylie family. 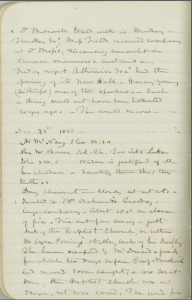 In another entry dated November 11, 1883 Theophilus writes, ““Friday night Athenian Society had the opening of its new Hall. Harvey Young (Aithiops) one of the speakers. – Such a thing would not have been tolerated 25 yrs ago. – The world moves. –” Note: Aethiops – antiquated term used to denote the dark complexion of an individual from Ethiopia. Harvey did not graduate from Indiana University, but rather returned to Indianapolis after three semesters to become a public school teacher in the Indianapolis Public School system. We know from articles published in the Indianapolis News that Harvey taught at IPS schools #19, #23, and #24 from 1885 to 1895. Census records were unable to determine his whereabouts following 1895. Visitors to Wylie House sometimes ask if the home was part of the Underground Railroad. We cannot verify that it was, but accounts from older local area residents lend support to the idea that it could have been. According to VisitBloomington.com, “The Covenanters, a group of Scotch-Irish Presbyterians from South Carolina, had settled just outside Bloomington by 1821. Believing that slavery was a moral evil, the Covenanters acted on their principles and during the Civil War provided a way station for escaped slaves traveling north on the Underground Railroad.” Both Andrew and Theophilus A. Wylie were active members of the Bloomington Reformed Presbyterian Church, so it is reasonable to believe they also held these views. 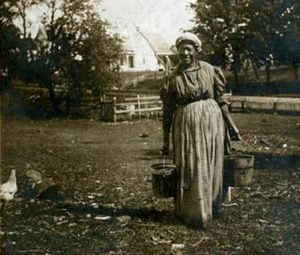 An article published in the September 1917 issue of Indiana Magazine of History entitled, “The Underground Railroad in Monroe County” identifies local individuals, church members, and contemporaries of the Wylies who are believed to have been active participants in the Underground Railroad. Wylie House is happy to assist with reference requests. Please contact us at libwylie.indiana.edu. 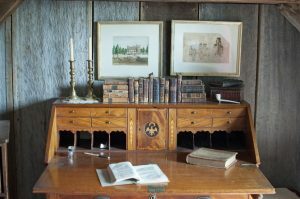 Next Next post: A photograph from the Wylie House collection is identified!